We found that the introduction of a pilot ultrasound curriculum integrated with the physical diagnosis course at our institution did not worsen year 1 medical student physical examination skills and may be potentially beneficial when compared to historic controls. Students who had the ultrasound curriculum had better overall associated OSCE scores compared to students in the historic control group. Students and faculty predominantly had positive responses to the course, and most agreed or strongly agreed that ultrasound has a valuable role in medical education. Faculty gave constructive feedback on how to improve ultrasound implementation. Other studies have shown that point-of-care ultrasound training can enhance ultrasound skills and specific physical examination skills such as abdominal and cardiac examinations.18,26 We believe that no previous study has shown that implementation of a point-of-care ultrasound curriculum in the year 1 medical student curriculum may have substantial benefits to the overall traditional physical examination. Previous work has shown that ultrasound curricula for medical students and residents, during their respective training, can improve their ultrasound skills20,26–31 when compared to control groups without ultrasound training.6,32,33 It inherently makes sense that learners who are taught any skill should outperform learners who are naive to that skill. Specific physical examination skills have also been shown to improve with introduction of ultrasound training. One study found that ultrasound improves year 1 medical students’ abdominal examination.17 However, only the abdominal examination was assessed in that study. Other studies have shown that medical students could more accurately diagnose cardiac diseases using ultrasound even when compared to a trained cardiologist using auscultation alone.32–34 Most of these studies used ultrasound defined end points; hence, the effect of ultrasound on traditional physical examination skills remained unknown. ultrasound scans. In point-of-care ultrasound,the clinical sonographer is the actual practitioner with a focused question regarding the patient being treated. The goal of point-of-care ultrasound would be to confirm or refute a diagnosis as a result of the practitioner’s physical examination.36 Point-of-care ultrasound may actually promote critical thinking because the sonographer knows what condition is of concern before performing the ultrasound examination rather than haphazardly performing an ultrasound examination looking for incidental findings, as may occur with CT, MRI, and comprehensive ultrasound examinations. Ultrasound curriculum implementation into medical schools has been shown to be feasible.1–7,37 However,many of these institutions have ample point-of-care ultrasound faculty experts and considerable industry support for numerous ultrasound machines. We piloted a curriculum with minimal resources, using only 4 ultrasound machines, 1 point-of-care ultrasound expert, and 8 ultrasound-naïve faculty to train a group of 163 year 1 medical students. We found that it was feasible to implement this curriculum through faculty development and student peer teaching. Another concern is the addition of time for ultrasound training into medical students’ already demanding schedules. Incorporating ultrasound directly into the required physical diagnosis course obviated the need to add more time to the overall students’ curriculum. Furthermore, having open ultrasound lab sessions allowed students to practice their physical examination and ultrasound skills on their own. Given the limited availability of point-of-care ultrasound experts an institution may have, we believe that most schools will need to use ultrasound-naive faculty members for ultrasound curriculum implementation. The feedback from the faculty members in this study raises many important points when implementing an ultrasound curriculum. We realize that integration of ultrasound is difficult because each school has a unique curriculum that has been in place for many years. An additional problem with ultrasound is that it can be a substantial financial burden to administrators and requires added student time and faculty commitment. Another concern may be that most schools may not have an ultrasound expert to adequately implement a curriculum.We found that a curriculum can be feasibly developed with minimal resources. Students in our study strongly agreed that peer teaching was useful for learning point-of-care ultrasound. Peer teaching has also been used successfully at other institutions.42-44 Further research needs to be done on the barriers to ultrasound implementation in medical schools and how implementation can be facilitated with limited resources. There were several limitations to our study. The control group was a historic control, and the students from both groups may have been inherently different, which could have caused the difference in OSCE scores. There were no notable curriculum or faculty changes between the 2 years, except for the point-of-care ultrasound implementation. Twenty-five student data points were missing from the historic controls, which may have affected the mean pre-ultrasound group scores. This study could have been improved if the groups were randomized, but we thought that all students would benefit from the ultrasound curriculum. There is no current recommended standardized curriculum, and the ultrasound curriculum we implemented may have had different results if we had more intense ultrasound training for students and faculty. The effect of ultrasound training on medical student proficiency in the clinical setting needs further investigation. We conclude that implementing an ultrasound curriculum into a physical diagnosis course is feasible with limited resources and may increase the physical examination skills of year 1 medical students. Overall, students and faculty had a positive response to the ultrasound curriculum. Despite the controversy that introducing ultrasound may decrease time for learning traditional physical examination skills and may cause reliance on such technology, our study found that by using ultrasound synergistically to learn the physical examination, there seems to be an overall benefit to the introduction of ultrasound into medical education. 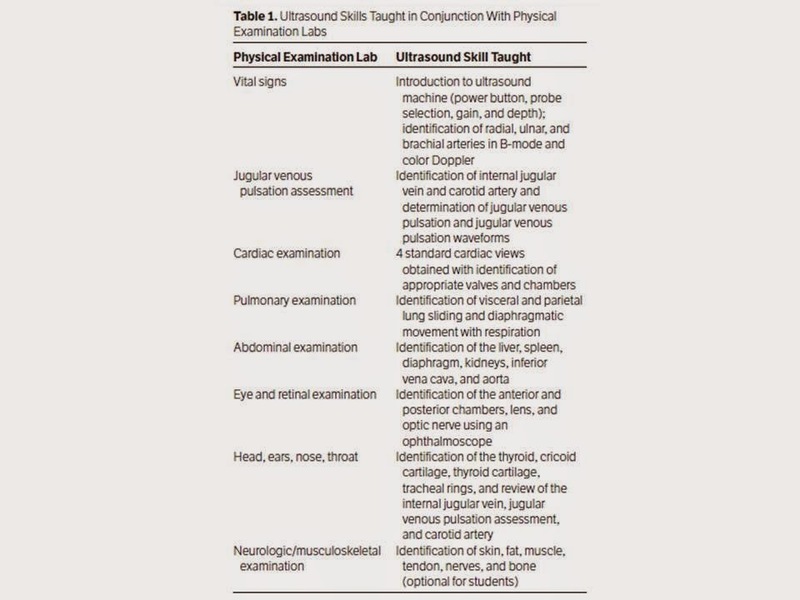 Dinh et al—Ultrasound Effects on Physical Examination in Medical Education, J UltrasoundMed 2015; 34:43–50.